Animated image generator for Birdy fans to create unique content to share on social media. Warner Music were looking to engage fans around the release of ‘The Fire Within’, the 2nd album from English singer/songwriter Birdy. 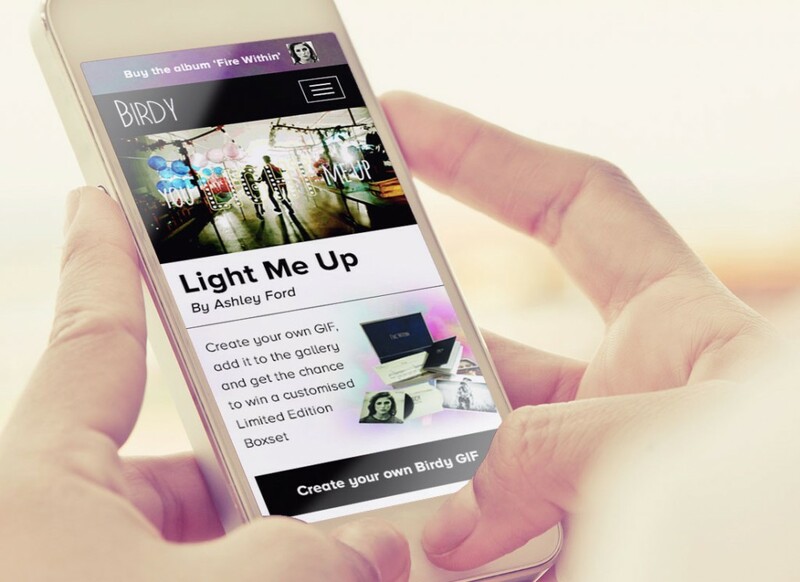 Whilst driving awareness of the new album, the key objective was to grow Birdy’s Tumblr fan-base via a web app campaign, with a sharing incentive for fans. Given the popularity of animated GIFs on Tumblr, we created ‘The Music Video GIF Generator’ which allowed fans to create unique content taken from the artist’s music videos. The GIF generator combined music video clips with favourite lyrics and choices of typography to produce a custom GIF created by the fan. All fan creations were then added to a gallery, from which Birdy chose her favourites to feature on her Tumblr page, and winners received signed and framed artwork of the album. The app was optimised for both web and mobile visitors and included social media sharing functionality throughout. Over 15,000 Birdy fans engaged with the GIF generator in a 4 week campaign period. Birdy herself chose her favourite GIFs to feature on her Tumblr and the winners received signed album artwork.